Whelped 2-24-64. He is 'Dynamo,' and we don't doubt him! 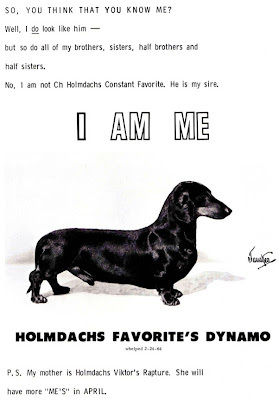 8.5" x 11"" page From The American Dachshund Magazine, April 1965. 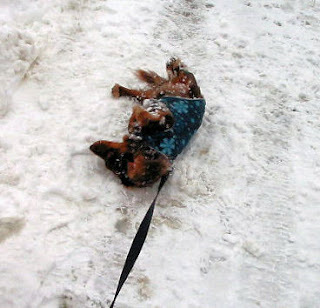 We never cease to be amazed by the innate loyalty of the dog to its canine or human friends. Regular readers of The Long and Short of it All have seen the amazing video of 'Sam,' the loyal dachshund who found his way to his human's funeral. You've also probably seen the above video in some form, as it's been viewed about a million times on youtube, where a dog attempts to rescue it's canine pal after it was hit on the freeway in Chile. My next door neighbor, Chip aka Freelowder has had a run of critter problems at his place. About two weeks ago something ate the heads off of 13 of his chickens. Sounds like a skunk but there was no skunk smell. This last week while Chip was off at work, his wife stuck her head out the door and called their two dachshunds to put em in for the night and here comes the black one dragging the red one by the hind leg leaving a trail of blood. She took him to the vet and after referencing his bite chart he determined it was a cat that did the damage. Maybe a Bobcat. Any ideas on sets for the trapping of this critter? I know they are very territorial and curious. Scents? Help if you can. Gotta get em. 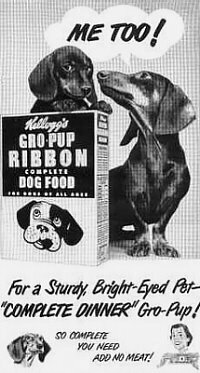 There's also the story of 'Truman,' the American bulldog/Staffordshire terrier mix who waited at the side of the road for 3 long days after his dachshund pal was hit by a car. Youtuber mhudson1137 writes about Waters: Waters was rescued on January 25, 2009 in Walterboro South Carolina. He was a stray and his dachshund best friend had been hit by a car sometime during the night of Jan 24th. He had been diligently waiting for his friend to revive in the road all night, when I saw him under a church sign across the street from his deceased buddy in 40F temperatures and misty rain. as you can see he's coming along nicely. It seems that modern-day humans sure have a lot to learn from their loyal companions: never underestimate the power of DOG. Have a great Friday. 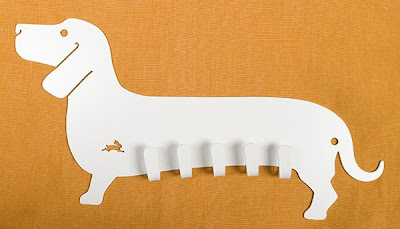 Here's a great coat rack for the kids, or even a nice leash and collar rack for the furry ones - just $28 at Rose and Radish. Material: Powder-coated metal; Size: 12.5"w, 6.25"h. The positioning of at least one of the nail holes adds to the humor. We can't get enough of red smooth rescue 'Baby Joe,' the dachshund heroine who saved her human from a pitbull-mix attack last week. Enjoy this news video from 39 online. 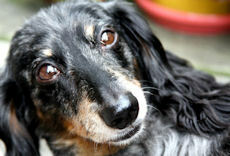 Read all about Baby Joe in yesterday's post: Dachshund Hero Saves Her Human From Dog Attack! Our dedicated friends in rescue are in the news today, spreading the good word about the hard work they do, all for the love of dachshunds. MWDR took in 185 dogs in 2008, compared to 95 in 2007, with the economy mostly to blame for the marked increase. "That is a huge increase for a small group like ours - fully self-supporting through adoption fees and donations and operating with about 20 foster homes," representative Dawn Janz said. Read all about the organization, including some of their tougher cases in a nice article at the Daily Herald. 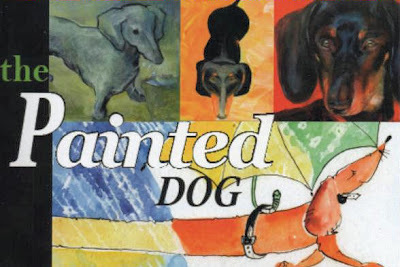 If you live in Toronto, Canada, and love dachshunds and art, head on over to The Workshop Gallery for "The Painted Dog" group exhibition, which celebrates.....what else......our long and short little friends. Works by Marie Charbonneau, Lorraine Roussel, Anya Romanenko and Mark Lauermeier will be on display through February 11th. But wait, there's more. 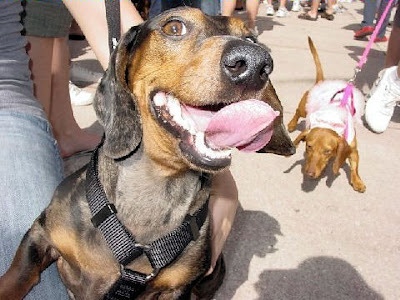 There's a local dachshund meetup there tonight at 7:30 PM. Find out more at meetup.com. 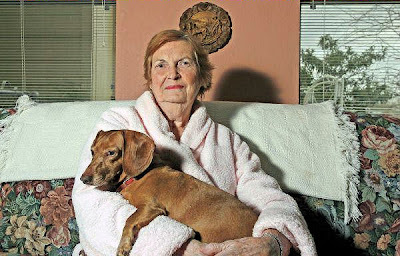 Dachshund Hero Saves Her Human From Dog Attack! Murray said she began to roll on the ground in an effort to soften the dog’s grip on her leg when Baby Joe leapt into action, launching an arsenal of thunderous barks while hurdling Murray as she rolled on her lawn. Murray said her attacker released her leg, due to the display put on by Baby Joe, and gave her enough time to deliver a solid kick to the dog and escape inside the home. Baby Joe also scampered to the house. Murray’s husband Art called Montgomery County Animal Control officials, who apprehended the dog shortly after the attack. Read all the details at The Courier. 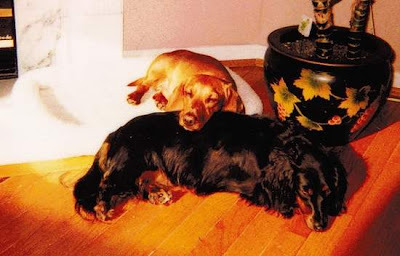 Meet red smooth 'Gustav' and his black and tan longhair buddy 'Blitz,' who hail from Deerfield Township, Ohio. 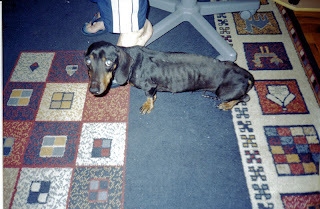 Gustav is one of the 1,000 dogs, mostly dachshunds, rescued from a Parkersburg, West Virginia, puppy mill last fall. 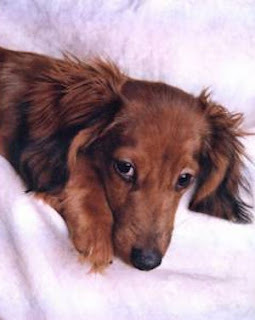 Gustav was one of 18 dachshunds taken in by The Cincinnati SPCA, who held a lottery for his adoption. "He arrived to our home weak, very thin and subdued," said his new owner, Evelyn Petrinowitsch. "Since then he has turned out to be one of the best dogs we ever had." Read all about Gustav and see a pic of him while he was still at the shelter at Cincinnati.com. It's great to hear that these rescues have adapted so well. Will it ever be warm again? 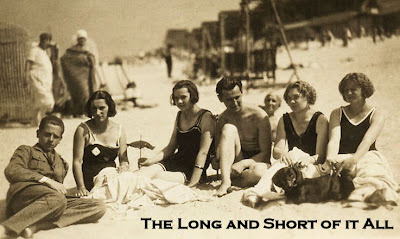 The dachshund in this beach photo from the 1920's sure looks comfortable. Unfortunately, we don't know which Countess of Northesk this is but if anyone has any more information, please send it in. Photo approx 1935? UPDATE: Thanks to our good friend 'Clancy' for finding out that this is indeed Dorothy Mary Carnegie (née Campion), wife of John Carnegie, the 12th Earl of Northesk, and apparently a descendant of William the Conqueror. More photos can be seen at the National Portrait Gallery. 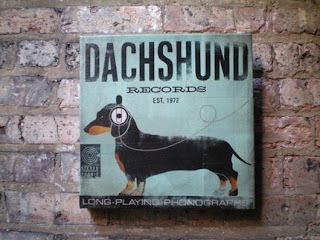 Or is that music art for dachshund lovers? Either way, it looks as if this original piece of art by Stephen Fowler might be sold, but there are similar ones available. It's mesmerizing, thanks to our pal Pee Wee, aka, P.W., for sending it in! 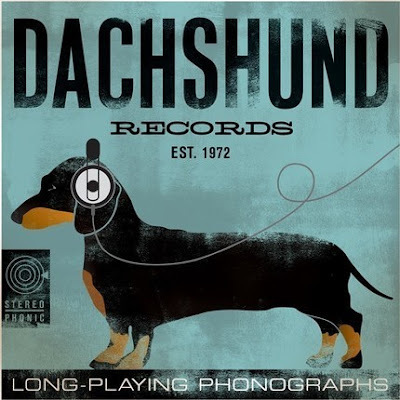 Just $75 From Etsy: DACHSHUND records album artwork on canvas original - This my original design of Album style retro artwork on canvas. - This is a handmade collage of antique paper, newsprint and other materials on 12x12x1.5 inch premium quality canvas. Check out this Chicago artist's work at Etsy or his website. 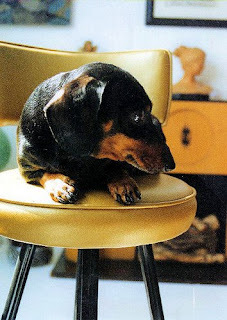 Eight years ago this week, a previous dachshund of ours passed away. His name was 'Louie.' 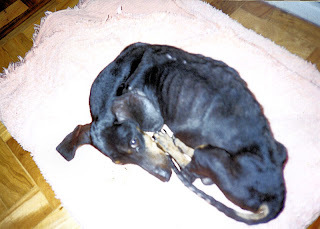 He was a tweenie smooth black and tan, and lived to be about 14 years old. His congestive heart failure as a result of his heart murmur finally got the best of him, but he fought it like a champ the last year of his short life. As we tend to say about the dogs in our life, there was never another dog like him. 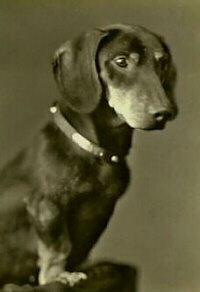 Louie was actually Louie the 3rd; he was the 3rd dachshund named Louie in our family name. 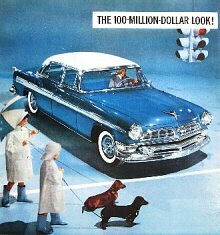 Dad had a dachshund named Louie when he was a kid. 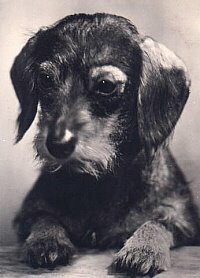 I had a dachshund named Louie when I was a kid (among other dachshunds), and this Louie was intended to be my nephew's dog. Turns out he didn't get along with the neighborhood kids, and I adopted him at 4 years old, and he moved to Chicago with me. Oh, the stories we could tell about Louie. We could talk about the time he killed a baby rabbit and brought it to my feet. He was so proud. Or the time he chased a cat at a gallery opening in Chicago and he mis-judged where the brick wall was, rolling and slamming into it in front of a hundred people who gasped in excitement....only to get up with all his pride as if to say "I meant to do that." Or the time he chased a rabbit under the rocks at Lake Michigan in freezing cold weather in Chicago. I didn't think I would see him again as there didn't seem to be any way out from under those giant boulders, but he eventually found his way out after about an hour, shaking horribly, and with blood on his chest from the rabbit chase. But today we'll talk about the time he turned a bad situation into a good one, and made a young kid very happy. A good friend of mine sent her 13 year old son to camp in Wisconsin. They’d been planning it for months, and he was really looking forward to it. Actually, he was a little nervous about the great outdoors having been raised in the city, but was willing to give it a try. I got a call one morning from my friend that things weren’t working out at camp, and that her son wanted to come home, and she needed me to drive her up and pick him up. It was about a 2.5 hour drive away, so I brought Louie along for the ride. We got there, and there was my friend's son, standing alone outside visibly upset. My friend got out of the car to talk to him to see what was going on – turns out he was the only African American at the camp, and all the other boys had been relentlessly picking on him and calling him names for days. He couldn’t stop shaking and crying. My friend isn’t one to let something like this go without having her say, and her son stayed outside while she went in to the office, and I’m quite sure, floored the camp counselors with a verbal assault that they’ll never forget until their dying day. So, we got into the car to head back to Chicago. Happy Louie was in the backseat, smiling, tail wagging. Her son really didn’t want anything to do with Louie; he was still upset, and he hadn’t been raised around dogs, so he wasn't sure of what to make of him. Louie didn’t give up that easily though. He kept trying to inch closer and closer to her son. Finally a hand came out to pet him. The crying stopped. We stopped at some little burger shack to get some food to go, her son hadn’t eaten all day. Of course Louie is going crazy with all of this food in the car, and some new people to trick into getting some handouts. From the back seat: “Can I give him a French fry?” Sure, just give him small pieces though, he doesn’t need a whole French fry. Snort. “OW! HE BIT ME!” He didn’t mean to, just be careful when you feed him. Snort. “OW! HE BIT ME AGAIN!” Watch your fingers and be careful when you feed him. Time it real careful, and let go of it as he tries to get it from you, and he’ll catch it in the air. “HE’S LIKE A SHARK! THAT'S SO FUNNY! HE’S LOUIE THE SHARK! MOM! (laugh laugh giggle giggle) LOOK! LOOK HOW HE JUMPS AND BITES AT THE SAME TIME! COME HERE YOU LITTLE SHARK!” Snort. Snort. “OW! HE BIT ME AGAIN! LOUIE THE SHARK!” (laugh laugh giggle giggle laugh giggle). An hour passed, french fries are long depleted, and her son is asleep in the back seat with Louie sleeping in his arms. It was amazing to see how quickly little Louie was able to turn around a really bad situation. That 2.5 hour drive back to the city could’ve seemed like 25 hours had it not been for him. My friend and I talked about that wonderful shark in the back seat for many years. 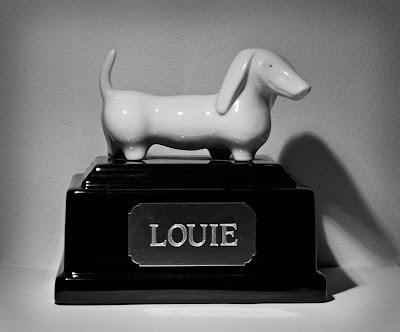 Top photo details: Louie rests comfortably in the urn I found on the net. I already had the white dachshund figurine I'd picked up from an antique shop in Amsterdam, and affixed it to the top of the urn. I love the slight smile on the figurine. Edgar The Stolen Dachshund Comes Home! Remember red longhair 'Edgar,' the Minnesota dachshund we first reported on back in November, who was stolen from his home in October during a break-in? It's with a gush of excitement that we can report that he is now back home with his mom! On Monday, the police received an anonymous tip, with the caller rejecting the $1,000 reward. Detective Mona Pearson (our hero!) made several attempts to follow up on the tip, and successfully retrieved Edgar from the home where he was reported to be on Friday. Read all the details at The Star Tribune. I couldn't drive to the police station fast enough, I really couldn't believe that it could be him. 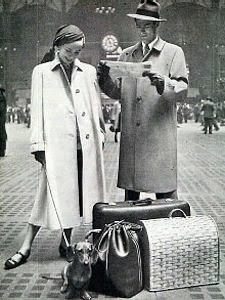 I waited in the lobby of the station and then she walked through the door with my little baby boy in her arms. It WAS my boy. He remembered me. I couldn't stop crying with joy. We drove home, he knew right where to sit. When we got there, he ran into the house and went straight for his "guy" - it was right where he had left it that morning before I left for work, that morning 3 long months ago, he knew right where it was. It was like he'd never left. Read lots more at Edgar's Dogster profile. Hundreds of dachshunds descended on Miami Beach, Florida, on Saturday for the 7th Annual South Beach Dachshund Winterfest! 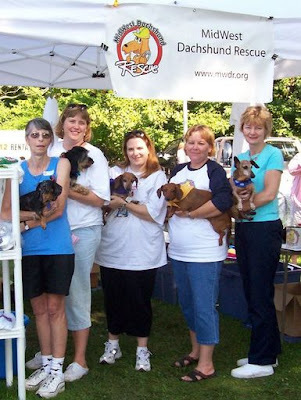 This year was the biggest ever; congrats to the organizers, and we know the dachshunds had a great time. See 21 nice pics of the event by photographer Federico Serrano in a set over at flickr. 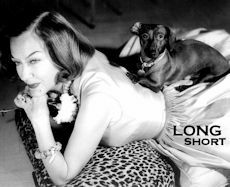 Also, don't miss THE WORLD'S LONGEST DACHSHUND PHOTO by Mr. Serrano, and see more pics as they come in at The Official Site of the South Beach Dachshund Winterfest. 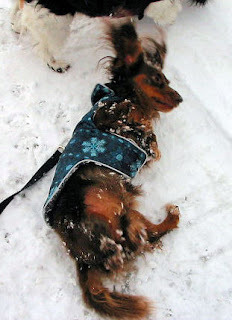 A Note From Joey and Maggie: Dachshund Massage! When do we get to do this again? We're exhausted, but boy did we have a nice day. First we went for a car ride to a local dachshund meetup; played, had treats, and sniffed our friends for a few hours, and then we headed to Red Dog House for an event where we got 15-minute massages for $15, all proceeds to a local shelter. We're pretty sure that this was the best 30 minutes of our lives. 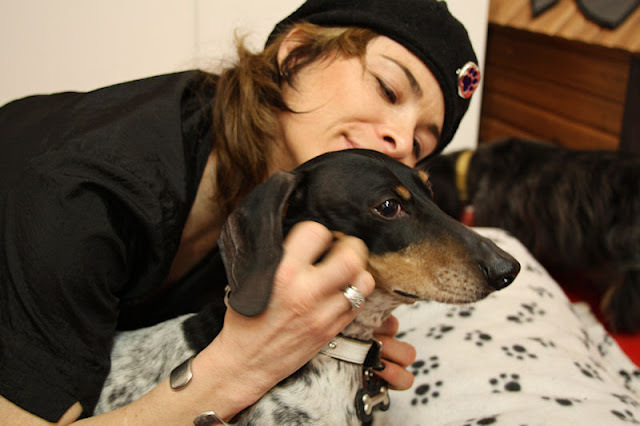 If you're in Chicago and need a great massage, head over to Bucktown Bow & Meow Pet Spa, and see Ursula Sanchez, certified massage therapist, certified animal hygienist (CAH) and canine massage therapist (CMT). Joey says "It felt great, and I was so relaxed......I loved it when she commented on how muscular I am." Maggie says "She's a real pro, and her gentle hands are like butter. This is heaven." 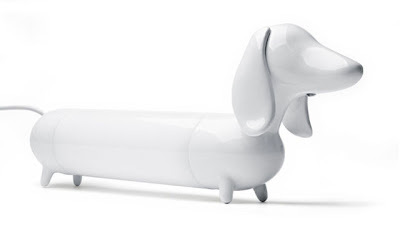 Holy Viral Video, it's a trifecta of awesome new dachshund videos for your Friday! Above, in the Dachshund Interspecies Musings category, don't miss Mali monkey playing with a dachshund puppy by youtuber Lindsey682. Next, we love to sing, and 'Jack' sure does love his pillow! His human, youtuber skt1961 notes: Jack the Longhaired Dachshund has an obsession with a pillow. It appears to be his security blanket. He carries it from room to room and freaks out if he can't find it. His co star Jordan didn't want to be left out, so he did a little dance while Jack sucked on his pillow. 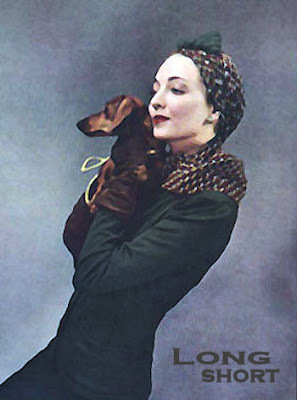 And finally, how about a little dachshund relaxation to wind down your week? This is the second video we've featured by youtuber wienerworld, and it's called Hiking the Sonoma Coast Hills. Breathe in. Hold. Breathe out. Relax. Meet helpful and handsome black and tan smooth 'Louie,' and his human, Dr. Judy Welch, a psychologist based out of Thousand Oaks, California. So he wouldn't have to be left alone as a puppy, Dr. Welch took Louie to the office with her. She soon discovered that he had a knack for helping her patients in therapy! Woof! 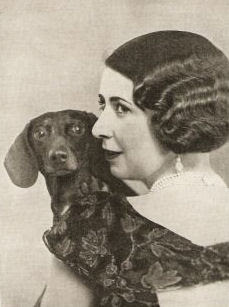 Excerpt from The Acorn: As the puppy snuggled in a crate while Welch conducted her sessions, clients were drawn to the pooch and began asking that he be allowed to sit on their laps or at least roam the office. The interaction between Louie and Welch's patients reaped immediate rewards. In the midst of people dealing with "painful and challenging" issues, Louie was able to sense their emotions and had an even greater capacity to adjust his behavior and "physical distance" to each person's comfort level, Welch said. "He was unbelievable, observant of all the patients but never intrusive," Welch said of her dog, which she now calls her assistant. "Louie has the uncanny ability to understand the emotions of others and is able to accommodate to those mood states. He has a sixth sense, especially for those who are depressed, anxious or feeling overwhelmed." 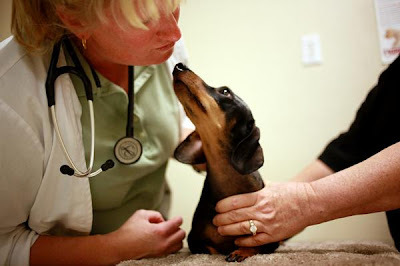 Read all about "Dogtor" Louie at The Acorn. We'll keep our introduction short on this very special story. Get ready to meet beautiful smooth black and tan 'Sassá' and her Mamita, Damiana Rodrigues, who hail from Brazil. Thanks so much to Damiana for sending in Sassá's tale! This is what dachshund love is all about. I used to be a rescuer, working with a group that rescues dogs and cats from Brasilia (Brasil) public kennel. 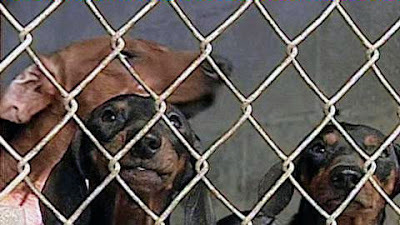 All animals that are left at the public kennel have only 15 days life - one week in observation to find out if they have rabies and 5 days for adoption. If they are not adopted within these 15 days, they will be killed together with rabies animals. So, to avoid this cruelty for healthy animals, our group takes care of all the animals we can and prepare them for our adoption fairs. Rescuers keep a few dogs/cats home, take care of them, feed them, bathe them and treat their diseases. As I live in an apartment I could only help puppies and small dogs. One day I was chosen to take care of a 2 year old wiener dog. 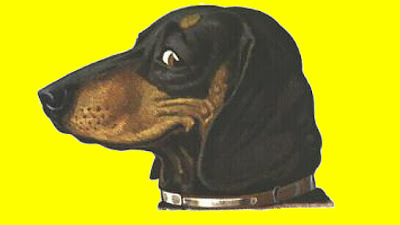 I knew Dachshunds to be nice dogs, but I have never lived closed to one. I said yes and later I went to pick her up. She was laying inside a cardboard box and the only thing she did was look at me with the saddest eyes I have seen in a dog. I took her home (still inside the cardboard box), she didn't move. And when I took her out of the box to bathe her I saw the most awful thing ever: she was starving to death... She was so weak, so skinny, so filled with bruises and wounds, that she could hardly stand up. I bathed her and dried her, she still did not move. I tried to feed her, she could not stand up to eat, so I had to feed her with a syringe. I named her Sassá (short for salsicha - portuguese word for wiener). She was difficult to eat because on the streets she got used to eating human food from garbages. So she would refuse her dog food. 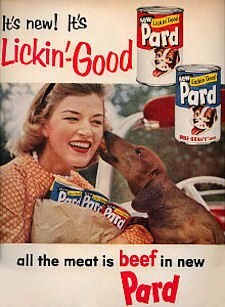 Even if we mixed dog food with human food, she managed to separate them and eat only the human food. But on Easter somehow she decided it was time to eat only dog food and from then on that's her diet. It took me 3 months of intense care, love, tender and lots of medicine so she could start getting fatter. But, although she was getting fat, her hair was still missing in a lot of places. So there went another 3 months of almost daily baths so she could look nice again. During this period whenever I took her to adoption fairs people would ask me if she was available for adoption. I always said she was on treatment and only when she was completely healthy she would be placed for adoption. Of course I was already in love with her but I needed some time extra to finally admit she was mine. Sassá taught me how amazing wiener dogs are: she is smart, she learns quickly, she is funny and she is the most adorable dog when she plays (and many times eats) her dental floss and her rubber balls. She also learned a few commands on her own: play dead, stop, go, wait. It was impossible for me, after 6 months of intense wiener dog life, to part with her. Unfortunately every bad thing that she's been through, all that weakness and hunger, left a few marks on her: she is always with some health problem (sinusitis, kidney crystals) and we spend a lot taking care of her. But that's nothing compared to the company and love she gives us. And now after 5 years together she is a mature wiener dog lady, weighting 20 pounds, with the most beautiful and shiny black hair, who eats only super premium dog food and who is so much loved by her Mamita and her Papito. The Dachshund Holds Firm at Number 7 on AKC's List of Most Popular Dogs in America! Congratulations to the lovable Dachshund for maintaining its position at number 7 on AKC's List of Most Popular Dogs in America! The labrador retriever retains the number 1 spot, while the bulldog keeps moving on up to number 8, right behind us! 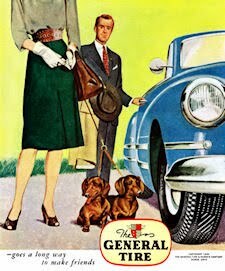 See all the 2008 registration stats, including how the dachshund fares in your fair city at AKC. Read all the tatty details at The Midlothian Exchange. Those ears! Those ears! What a great way to get off that winter weight when it's so dang cold outside! From youtuber jlt1102: This is my doxie running on the treadmill while her BIG (great dane) brother looks on from the bench. He was on the injured list as you can see from his leg bandages. 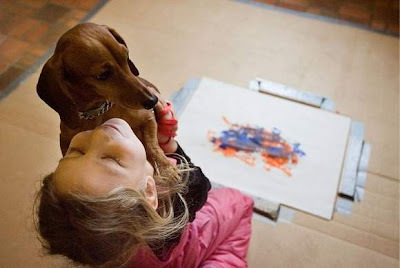 Sophie Abney, 7, congratulates her dog and Christmas present, 'Zoey,' after Zoey created the masterpiece of art seen in the background at the Wenatchee Valley Museum and Cultural Center in Wenatchee, Washington. Source. 'Bob' the dachshund poses with his family inside the the chapel at their new funeral home in southern Alabama. Source. 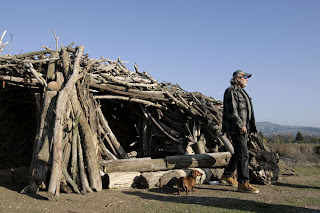 Darius Heskett, 56, and his dachshund 'Midget,' labored for two and a half years, assembling tree limbs, pieces of telephone poles and other river flotsam to create Chaunté Groove, a construction of pure whimsy where Heskett and Midget would rest while on their river walks in Napa Valley, California. The structure appeared on the front page of the local paper, then the city tore it down amid fears someone could get hurt playing in it. Source. 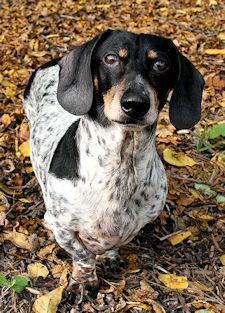 Do you remember 'Tristan,' this beautiful black and tan smooth dappled boy who came into rescue last fall as a paralyzed stray? 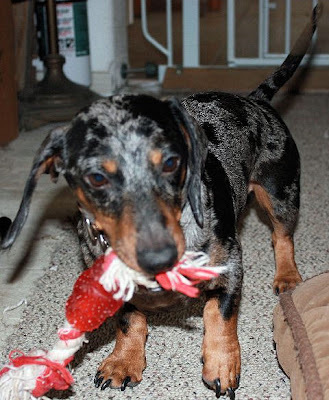 If you need to catch up, check out Those Special Dachshunds: Meet Tristan! Well we got him in Sept, the 30th, and he was completely paralyzed, he did have deep pain and wagged his tail a TINY bit not not a lot. We purchased him a cart, and he used it until the end of November when he just stood up one day and began tottering around, now he gets around well enough to not have used the cart since pretty much the end of November. Here are 2 pictures, one of him while he was "down" and one while he's now up and walking - his muscles in his back legs have built back up to where they are almost like normal dog legs. Before they were flaccid and atrophied! Above is the before walking pic, his legs are all atrophied. And a pic of Tristan up and walking! Tristan is an inspiration for us all...both dog and human. Make sure to visit his human's rescue organization: A Paw Up. 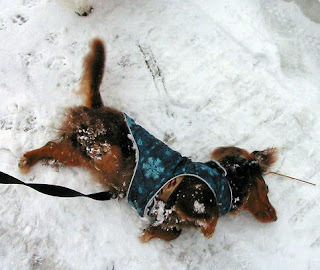 Related: Those Special Dachshunds: Meet Tristan! 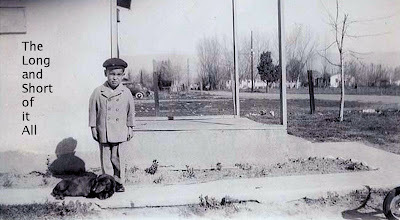 It seems so trite for us to post a vintage photo of a young African American with his dachshund buddy on the eve of Barack Obama's Presidential Inauguration, but there you have it. 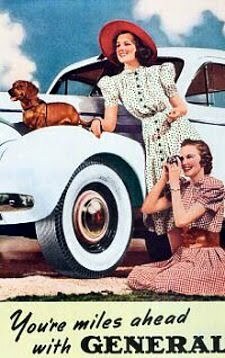 This is a dachshund blog after all, and sadly we can count on one paw the photos we've posted of dachshunds with their beloved African American humans. Is it OK to even type this out? Enjoy your Martin Luther King, Jr. Holiday. “When he first came in, his back legs were completely down,” said Griffin’s owner, Roberta Brown. “Now, he’s a sprinter.” Brown started Griffin’s acupuncture with Foster at Mission Hills Veterinary Center in September of 2008. Read all about Griffin's treatment at the Naples Daily News. 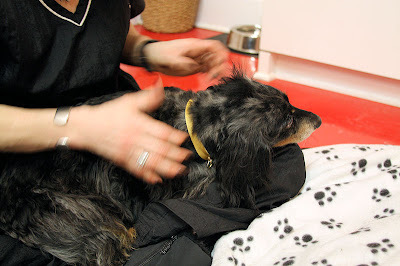 Acupuncture sure seems to help a lot of dachshunds who suffer with IVDD. 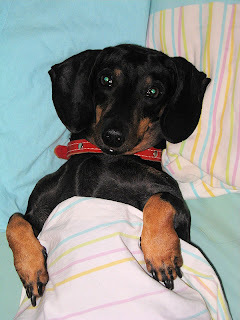 Read more great articles about Dachshunds and Acupuncture. "Most of them had mange, but overall they were in good shape and well fed," Lori Hartman, humane society director, told the Times-Union. "She loves them," she said. "But it was a lot for her to keep [up] with. She just got overwhelmed." Hartman said the woman isn't being charged because she voluntarily surrendered the dogs. Under the supervision of social workers, she has cleaned up her home. The humane society allowed her to keep two of the dogs. It is working with her to get them spayed and neutered, Hartman said. 2009 must be the year of the Dachshund! Just last Friday, we reported on 'Emma,' the Connecticut Pet of the Year, and now Frankie, The Walk'n Roll Dog is to be inducted into the Wisconsin Pet Hall of Fame! 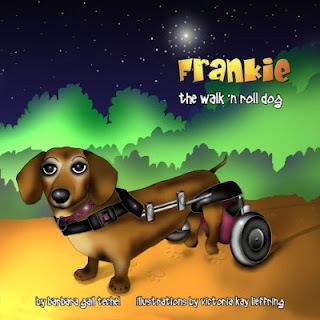 This is a well-deserved honor, as Frankie is one of the busiest dachshunds we know. Frankie will be inducted in Green Bay, Wisconsin, on February 28th, 2009. You can read all about it at Joyful Paws. Woof! The SPCA for Monterey County, California, is offering a $1,000 reward for information leading to the arrest and conviction of the person who abandoned a dachshund in Marina on Monday. Read more at The Californian. 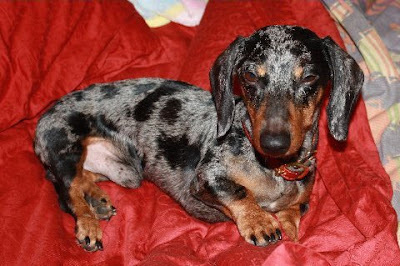 Out of Caddo Parish, Louisiana, we're awful glad to hear that little red smooth dachshund 'Dixie' is on the mend. Read more at WOAI.com. Thanks for sending in the hilarious photos! 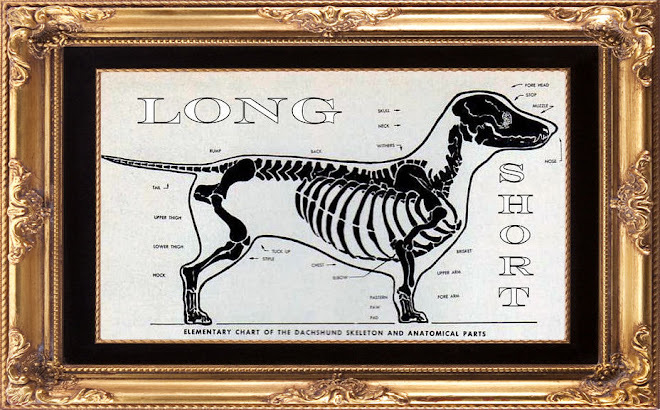 We first heard Olive's Song written for 'Olive' the Dachshund by Eric Watson on the home page at Dodgerslist, your resource for intervertebral disc disease. A few days ago, a video of the song with photos of Olive was released on youtube. Enjoy it here, it's a beautiful song, and Olive is a beautiful girl. But wait, there's more! 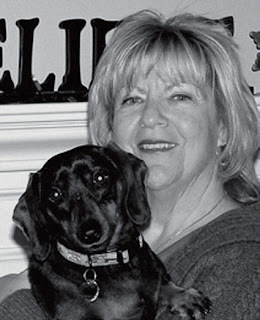 Barb Techel of Joyful Paws has just interviewed Olive's mom, and you can read all about Olive and find out more about the song. Don't miss it. 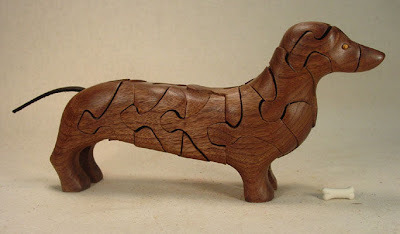 This stylish dachshund puzzle sculpture is handcrafted by Peter Chapman at his studio in the Blue Ridge Mountains of Virginia. It measures 11" x 5" and has a bone "surprise" on the inside. Find out more at Chapman Puzzles. Merit Ultra Lights: Discover the rewards of thinking light. 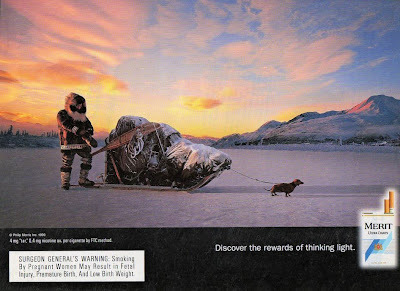 We don't think that a cigarette would help the poor dachshund in this ad! Following a blizzard, the coldest weather in decades is heading for our home in the MidWest. It's gonna be a cold one. 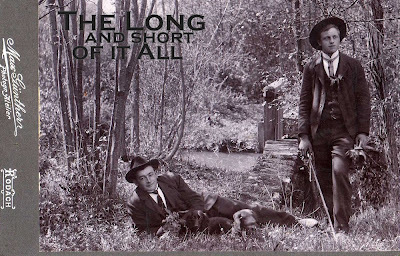 Two well-dressed young men in the woods holding flowers and posing with their dachshunds. It's anyone's guess, really. 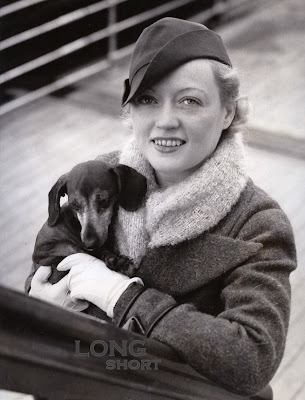 Noted Actress Returns From European Visit: Marion Davies, well known actress, shown on board the S.S. Bremen as she arrived in New York today, September 27th, after an extended visit to Europe. Is there any other way to travel? Thanks to our pal 'Polly' for sending in the link to this incredible pet carrier. 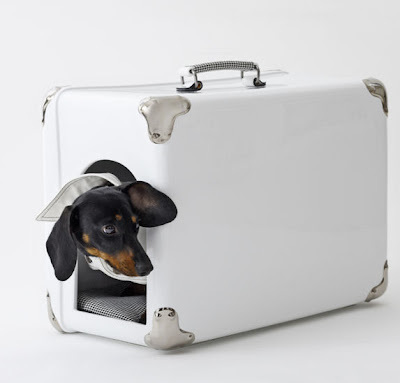 Ceramic suitcase doghouse from designer Marco Morosini for Bosa features platinum details on white base to give it a rich look to match your impeccable style. 54 cm width x 40 cm height x 28 cm depth. About $900 at Wannekes. 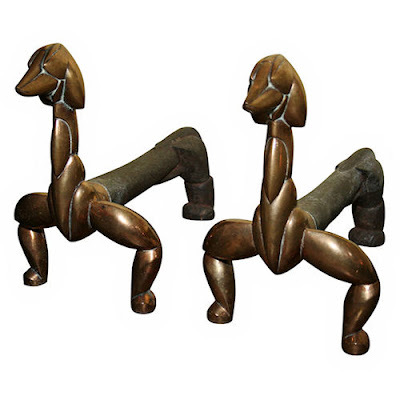 Thanks to our friend 'Ali' for sending in the link to this pair of amazing antique bronze and iron dachshund andirons. They would have looked great in Brooke Astor's fireplace, or maybe they would look great in yours! By Warren Wheelock, American 1922, stamped "Pat'd April 18 1922 by Warren Wheelock".13" h, 8" w, 15" d. Price: contact dealer. 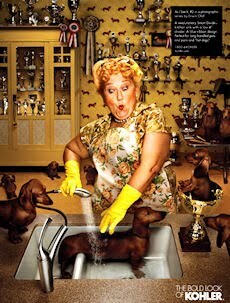 After just a year on youtube, this dachshund video titled Weiner dog freaks out in the bathtub has over 100,000 hits! Thanks to our pal 'Clancy' for finding it! Is your dachshund crazy for water like 'Rudy' is? Connecticut Pet of the Year! Emma will be honored Feb. 3 by the state Veterinary Medical Association for her work as a therapy pet. The dog was nominated to receive a Pet of the Year award by local veterinarian Dr. Robert Belden. She will be honored at a celebration dinner at Mystic Aquarium. 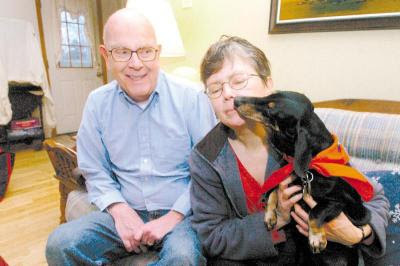 Dave Shaffer is quick to say all the credit for Emma's good deeds and training goes to his wife, Debby, who regularly takes the dog to a Kent retirement home or to visit mentally disabled adults in New York state. Debby Shaffer, an occupational therapy specialist in New York state, has made more than 300 therapy visits with Emma. Way to go! Read more about Emma at The News Times. Four men were bragging about how smart their dogs are. To show off, the Engineer called to his German Shepard. T-square trotted over to a desk, took out some paper and a pen and promptly drew a circle, a square, and a triangle. 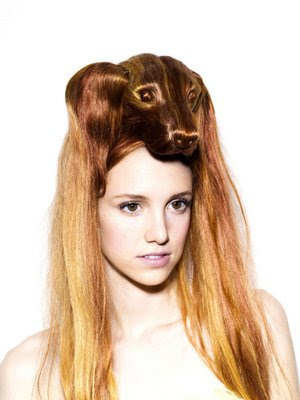 But the Accountant said his Collie could do better. He called his dog and said, "Spreadsheet, do your stuff." Spreadsheet went out into the kitchen and returned with a dozen cookies. He divided them into 4 equal piles of 3 cookies each. 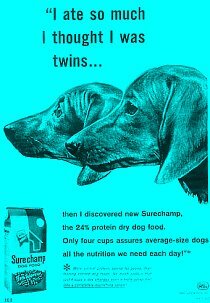 But the Chemist said his Chocolate Lab could do better. 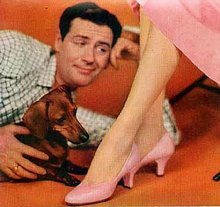 He called his dog and said, "Measure, do your stuff." "What can your dog do?" Coffee Break jumped to his feet, ate the cookies, drank the milk, pooped on the paper, had his way with the other three dogs and claimed he injured his back while doing so, filed a grievance report for unsafe working conditions, put in for Workers Compensation and went home for the rest of the day on sick leave. MILKY, interactive interior LED light by Korean designer WNcart. 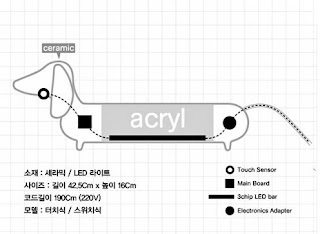 About $110, not sure of availability outside of Korea. The tail is the power cord! Available with switch on cord or under chin. 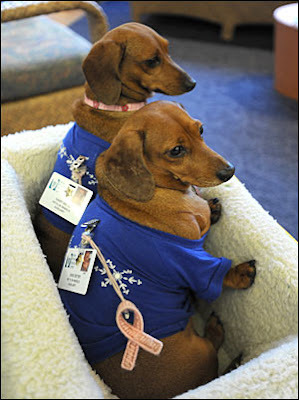 Meet pretty red smooths 'Daisy' and 'Dixie,' who visit patients at Anne Arundel Medical Center in Annapolis, Maryland. Through the county's Pets on Wheels program, the half sisters also travel to 3 other hospitals and homes as therapy dogs! Woof! Such busy dogs......, we're lucky if we even make it out of the bed on some days. Read all about the Pets on Wheels program, and see several nice photos of Daisy and Dixie in action in a slideshow at Hometown Annapolis. Who Is The Top Dog Here?